A long-established iconic name in motorcycling, the Thruxton is the first of our motorcycles to be re-created as a Triumph Factory Custom. As well as all the focused sporty attitude of the legendary café racer, this incredible TFC model celebrates the best of British engineering, detailing and finish with this ultra-rare never-to-be-repeated version that delivers more on every dimension. 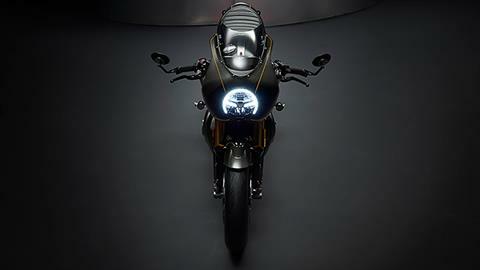 UNIQUE: Only 750 Thruxton TFC motorcycles will ever be made. Each of those 750 motorcycles is a true factory custom special, with a high-value individually-numbered edition plaque and unique TFC premium badging. 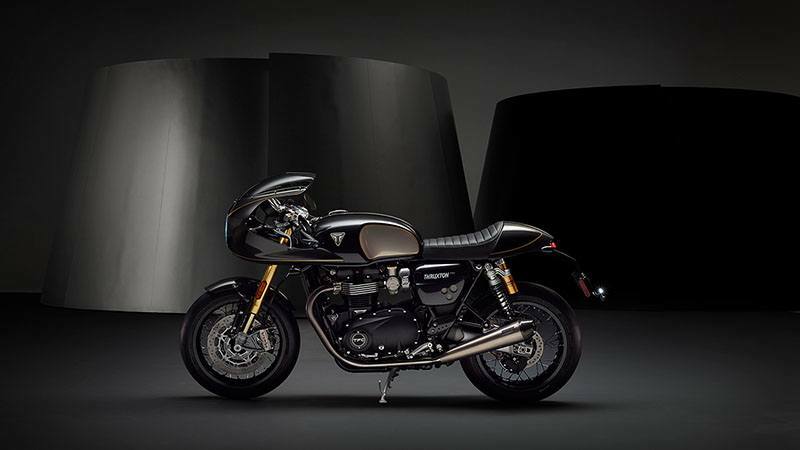 PERSONALIZED: Every numbered TFC motorcycle is supplied with a special TFC handover pack which includes a numbered certificate signed by Triumph Motorcycles’ CEO Nick Bloor, a personalized TFC custom build book and a branded motorcycle cover. 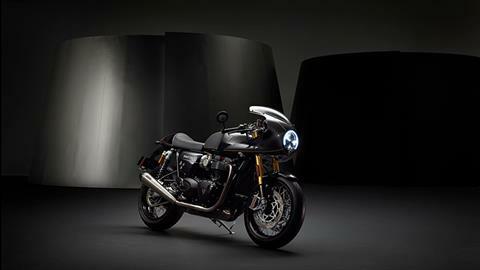 MORE POWER: With the Thruxton TFC comes an incredible increase of 10 HP peak power over the standard Thruxton R model. The exclusive TFC engine update includes new lightweight low-inertia crankshaft, clutch, balance shafts, rare earth alternator, magnesium cam cover and thinner-walled engine covers. CATEGORY-LEADING SPECIFICATIONS: Innovations in design include engine weight savings, aluminum engine cradle rails, rear mudguard removal, a lightweight factory-commissioned battery and stunning one-of-a-kind carbon fiber fairing and bodywork. 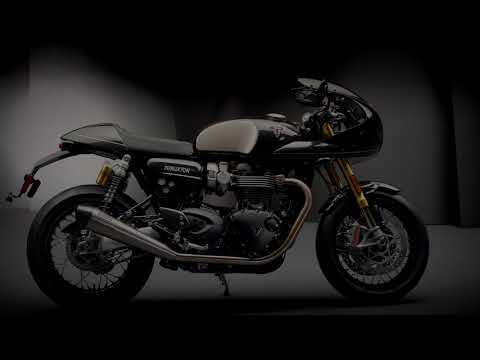 HIGHEST-EVER CAPABILITY: Now with three upgraded riding modes (Road, Rain and Sport), all-LED lighting including 7” headlight DRL with unique TFC badge, tail tidy and paddock stand bobbins, there’s more capability than ever before from this extraordinary new 2019 Thruxton TFC motorcycle. THRUXTON TECHNOLOGY: This incredible TFC includes all of the high-specification rider technology found on the Thruxton and more, including ABS, traction control, torque-assist clutch, ride-by-wire, liquid cooling, USB socket, engine immobilizer and feature-packed twin clocks with updated faces and gold detailing unique to the TFC. ENGINE UPGRADE: As well as significant weight savings, the TFC Thruxton engine is updated with high compression pistons, revised ports and new cam profile. PREMIUM ÖHLINS SUSPENSION: Exclusive premium Thruxton TFC fully adjustable Öhlins suspension setup, featuring NIX 30 upside down front forks with 1.69 in. (43mm) travel and RSU with piggyback reservoir & billet machined aluminum adjusters. HIGH SPECIFICATION BREMBO BRAKES: Brembo 4-piston radial monoblock calipers with twin floating Brembo discs contribute to the Thruxton TFC’s excellent stopping power and control. BREMBO MASTER CYLINDER: Premium Brembo radial master cylinder, plus MCS span and ratio-adjustable brake lever, delivers extra performance for confident control. UNIQUE EXHAUST SYSTEM: The one-of-a-kind twin exhaust system created specifically for the TFC model incorporates Vance & Hines titanium mufflers with carbon fiber end caps. 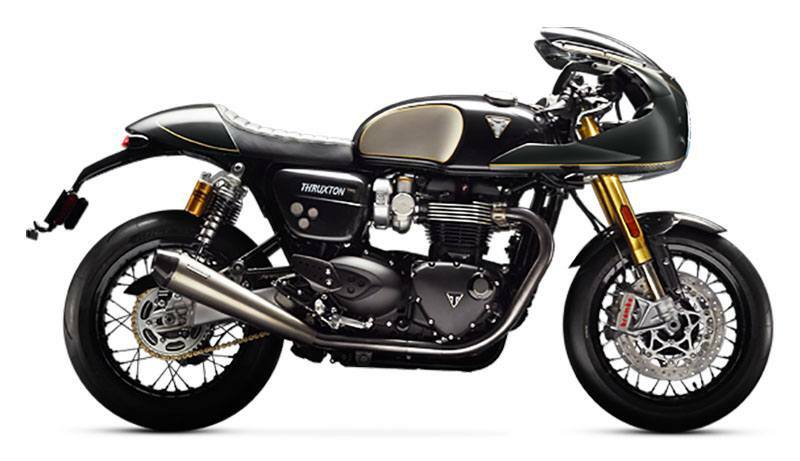 EXCEPTIONAL SOUND: Top quality motorcycle engineering combines to provide an exceptional rich and raw British twin soundtrack that distinguishes the Thruxton TFC as one-of-a-kind. RACE SPECIFICATION TIRES: Super sticky Metzeler Racetec RR tires for maximum feel while riding. Front 120/70 ZR 17, rear 160/60 ZR 17. PREMIUM DETAILING: A host of exclusive beautiful finishes sets this stunning motorcycle apart from any other Thruxton and includes: high-value TFC badging, brushed tank knee pad with hand-painted gold coach lining, eye-catching black RSU springs with black Öhlins decals, a unique key with distinctive gold detailing, billet machined aluminum oil filler cap and tinted screen. DISTINCTIVE FEATURES: Staying true to the original legendary sporty looks and attitude of the Thruxton, the TFC includes a brushed flip-top locking Monza cap, twin throttle bodies with brushed intake finisher, Daytona R footpegs and clear anodized aluminum swingarm. 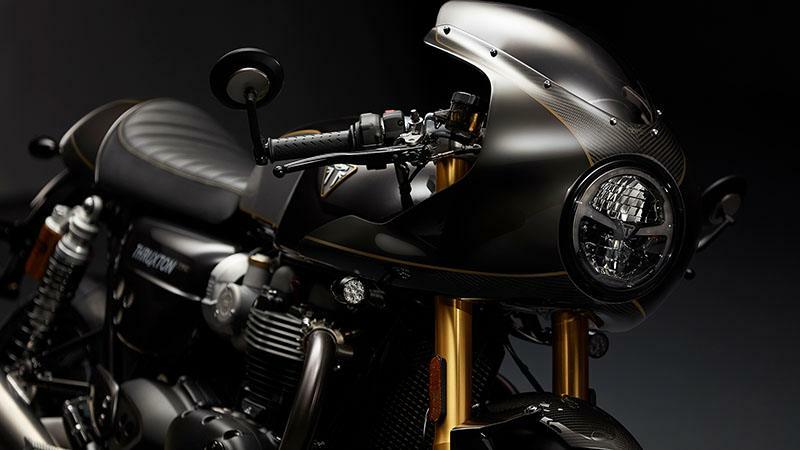 CARBON FIBER FAIRING & BODYWORK: The Thruxton TFC’s beautifully-engineered one-piece carbon fiber cockpit fairing, and carbon fiber front mudguard, seat cowl, heel guards and muffler end cap: all deliver premium style, strength and weight savings. BILLET MACHINED TOP YOKE: The one-of-a-kind top yoke is presented in beautiful billet-machined aluminum and features unique TFC branding and individually numbered limited edition Thruxton TFC badge. BLACK ANODIZED WHEEL RIMS: Beautiful black anodized wheel rims enhance the TFC’s carbon black styling, the 17-inch front and rear wheels are built in a multi-wire spoked classic style. LUXURY LEATHER SEAT: A premium feature, this is a durable real leather seat with beautiful gold stitched detail complemented perfectly by the crafted carbon fiber seat cowl. BRUSHED NICKEL MIRROR CENTERS: To enhance the overall high quality feel, the Thruxton’s unique brushed nickel mirror centers are a subtle design feature that adds an extra style dimension. METALLIC GOLD CHAIN: The premium metallic gold chain is an eye-catching feature that matches the gold detailing on the tank and the front forks. UNIQUE BADGING & INSTRUMENT FACES: Unique premium badging and instrument faces add to the exclusivity of this motorcycle, as do the distinctive tank and engine badges with stand-out gold detailing. UNIQUE CARBON BLACK PAINT SCHEME: Distinctive and unique premium Carbon Black paint is complemented by a matching dark scheme across the whole motorcycle, including black anodizing, brushed nickel and real carbon fiber.